It’s been Twenty Days into my quest for a Paruresis Cure. The funny thing is, there is none! You will always have some Pee Shy Symptoms still left in you no matter what you do. Even if you can pee in a public bathroom with no problems, you’ll probably still feel some sort of anxiety walking into the john or peeing around other guys (especially if there’s a trough). You’ve probably been carrying this social phobia around all your life, and no amount of practice or treatment will ever rid you 100% of your feelings and behaviors. But I’m cool with that. I only want to pee when I need to pee. That’s all! Peeing today with my Pee Buddy Mike seems pretty easy. I don’t know why, but half the time I end up peeing without thinking about it. I have resorted to NOT time myself anymore. That seems to add stress to my already heightened anxiety levels. So instead, I just stand there and relax. Most times today I was able to urinate pretty quickly. It seemed like I was in and out in just a minute or two. I got some comments on my site here from a 19 year old college student, who talked about Breath Hold and how it’s worked for him and he can pee in public now. 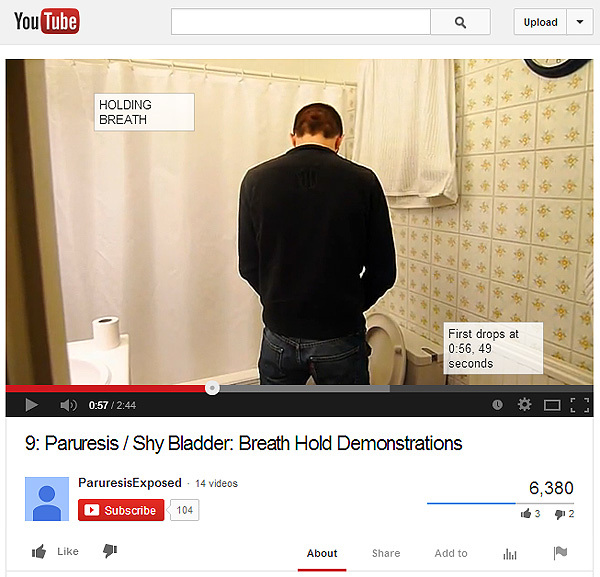 It makes me wonder if I should practice and attempt Breath Hold again (as seen here in Paruresis Exposed’s YouTube Channel). The visitor said that combining my efforts (home desensitization) along with Breath Hold should do the trick. I have had a lot of success with the breath hold in the past 2 years. In a nutshell, I used to suffer from this all throughout high school, but learned of the BH 2 weeks before my senior year. I then practiced for 45 seconds every day for 2 weeks until I finally got it just in time for school to start. As you can imagine, standing there for 45 seconds was awkward for a while, but after about 2 months of using it successfully every day (I must have had the breath capacity of a pro diver) it only took me 10 seconds exactly from the time I started walking to the time I got there to be ready to go. When I got to college, I realized that it is even easier once you get it that quick to simply take a small inhale (~1mL) of air through your mouth (a “chirp” so to speak) right before the PF drop, and it will allow you to start your stream voluntarily at that point. Long story short, I had 10 times the confidence and couldn’t recommend seeing it through enough. Just do it every day or you will lose the ability. Eventually using that little modification, I could do all stalls 100 percent with only a 2 second BH, even with other people watching. What you said about placebo is true, and the feeling of empty lungs gives me confidence in situations for some reason, and that is a good example. Exhale your air now, and you will feel how it would naturally lend to a feeling of “I can do this” when approaching, especially when coupled with previous success. I was never able to get Breath Hold to work properly on me, even though I thought I was close at times. Sadly, I gave up after about 2 weeks of practice. I’m guessing that wasn’t enough time to get over a life-long curse. So I’m going to start Practicing Breath Hold AGAIN! See where it gets me with my Pee Buddy.